In a Washington, D.C. courtroom this past Tuesday, Voices’ Kathy Kelly and her fellow activist Richard Ochs accepted guilty pleas for their part in a January 2018 action at the D.C. office of House Minority Whip Rep. Steny Hoyer. They had been protesting the devastating, ongoing three-year war on Yemen being waged with intense U.S. support by the U.S.’ client dictatorship in Saudi Arabia, in coalition with regional allies. We present Kathy’s and Richard’s sentencing statements below, followed by an account of the initial arrest. (Kathy asked that we hyperlink this American Conservative op-ed by Daniel Larison, decrying the Saudi coalition’s long-dreaded and apparently imminent bombardment of Yemen’s vital port of Hodeidah, an attack which (if not prevented) promises to throttle most of the humanitarian aid now reaching that famine- and epidemic-stricken country. 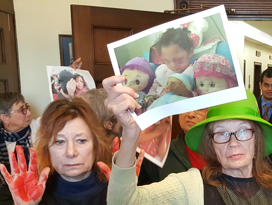 Bipartisan opposition to the Yemen war is shown to have been increasing by several nearly-successful U.S. Congressional votes, including the one which prompted Kathy’s and her fellow activists’ January action). “On January 11, 2018, I was part of a delegation requesting Representative Steny Hoyer, the minority whip in the U.S. Congress, to help legislate an immediate end to U.S. participation in a Saudi-led coalition’s war against Yemen. The U.S. has sold cluster bombs, laser guided missiles, littoral combat ships, and other weapons to the Saudi-led coalition. U.S. jets refuel Saudi and Emirati warplanes in mid-air during bombing sorties. The paralyzing blockade and devastating airstrikes exacerbate suffering in Yemen, where Severe Acute Malnutrition afflicts 400,000 children. In January, UN officials said 8 million Yemenis faced starvation; Suspected cholera cases had reached one million. “Yemeni children facing death by starvation and preventable disease pose no threat to U.S. people. The food and clean water they hunger and thirst for could reach them, but not if elites continue to blockade Yemen’s ports, bomb roadways, destroy sewage and sanitation systems, attack fishermen and farmers, and use starvation and disease as tools of war. “I concur completely with the statement by Kathy Kelly. “Because constituents of Steny Hoyer were unable to obtain an appointment with Hoyer’s staff despite trying 8 times over two months last year, I volunteered to hand-deliver a letter signed by 10 constituents to Hoyer’s D.C. office. “Two of us delivered that letter on December 15, and asked to speak to a staff person, but were refused. We were also refused a name, phone number and business card of a staff person. None of the 10 constituents who signed the hand-delivered letter received a reply from Hoyer’s office to this day, 5 months later. Kathy and Richard were sentenced to time served, freeing Kathy for upcoming actions supporting the Kings Bay Plowshares in advance of their own trial, and delegation work with the Afghan Peace Volunteers. Five of Kathy’s fellow Hoyer office arrestees will go to trial this fall, with court dates set for Oct 2 and 3. 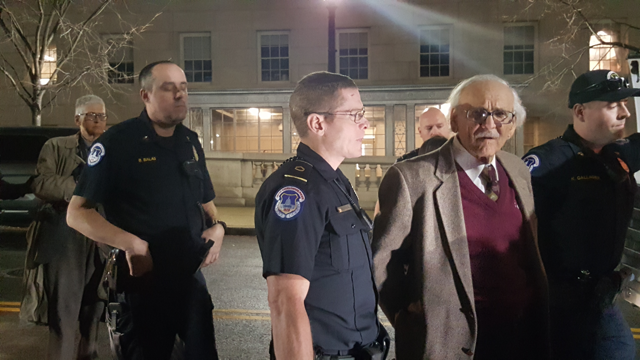 Seven activists, including Voices’ Kathy Kelly, were arrested Jan 11th for refusing to leave Rep. Steny Hoyer’s Washington DC office unless the Congressman (and House Minority Whip) committed to bring a vote on legislation to end the U.S.-Saudi war against Yemen. Under intense bombardment and naval blockade, Yemen is poised to become the new century’s worst case of epidemic and famine; in the worst global famine year in the history of the UN. The activists, convened by the National Campaign for Nonviolent Resistance, voiced three main demands: that Rep. Hoyer speak out against Saudi war crimes, that he condemn any further U.S. arms sales to the Saudi-led coalition bombarding and blockading Yemen, and that he help bring to a vote (and ensure much-needed debate on) House Resolution 81 invoking war powers to end U.S. involvement in the Yemen war. (They also urged Rep. Hoyer to vigorously, publicly, reject President Trump’s cruel dehumanization of the world’s most desperate places as “s***hole countries”). Arrested in the action were Kathy, Janice Sevre-Duszynska, Phil Runkel, Malachy Kilbride, Joy First, Alice Sutter, and Richard Ochs. Voices’ Brian Terrell had been arrested in a previous action coordinated by Witness Against Torture in Washington that day. A bipartisan Senate resolution on Yemen will be introduced in mid-January and has a good chance of passing. The Yemeni civil war, between Houthi rebels and the Saudi-backed government, is nearing its third anniversary. 11m people (39% of population) in “acute need”. 8m are at risk of famine. 2m are internally displaced. The cholera epidemic has surpassed a million cases, the worst recorded globally in modern times. Other diseases are emerging, such as diphtheria, given the collapse of the health system and infrastructure. The Houthi rebels continue to control the highlands, where the majority of the population live, and the frontlines have only shifted slightly in the last six months. One area of advance by government forces is the west coast, moving towards Hodeida port, the source of most food imports into rebel territory. Disruption of the port would severely harm humanitarian aid (which was temporarily halted in Nov-Dec when Saudi Arabia intensified its blockade in response to Houthi missile firings). There is no clear end-game in sight and the Houthis could conceivably hold out for years, even if Hodeida fell. Even if the government were to eventually defeat the Houthis, fresh conflicts are likely given deep divisions within the anti-Houthi camp (such as South Yemen separatists), President Hadi’s unpopularity and the potential for jihadist groups (Al Qaeda, Islamic State) to fill vacuums, as they had done repeatedly. The longer the war continues, the harder it will be to stabalise and rebuild the country. A negotiated end to the war, based on a consensual federal structure, together with sustained regional/international aid offers the best hope for regional stability and humanitarian improvements. Despite commitments by Saudi Arabia to the US to improve targeting and reduce civilian casualties, there is little evidence of this happening. UN records show hundreds of civilian casualties a month from Saudi airstrikes, including 54 civilians killed in a market on 26 December. The war in Yemen was further complicated in December when the former president, Ali Abdullah Saleh, tried to shift sides from the Houthis to the Saudis, but was swiftly killed. This has created another vector of internal conflict (between Houthis and some Saleh loyalists). It has also reinforced the (misleading) Saudi narrative that the rebels are an Iranian-proxy which, together with Houthi missile firings at Riyadh, has further reduced prospects for peace negotiations. There is growing frustration with the war in Yemen in both parties and chambers. 4 Republicans supported the June 2017 resolution to block arms sales to Saudi Arabia. 3 Republicans cosponsored House Con. Res 81 (although the House leadership blocked its progress). The National Defence Authorisation Act (14-Nov-17) included provisions requiring reports to Congress on efforts to reduce harm to civilians in Yemen and on the administration’s strategy in Yemen. President Trump Tweeted on Dec 6th that Saudi Arabia should “completely allow food, fuel, water and medicine to reach the Yemeni people… immediately”. There are indications that even more Republicans will support (and fewer Democrats oppose) a more limited resolution on War Powers, rather than on arms sales. Some conservative groups (such as FreedomWorks and Campaign for Liberty), are supportive of the resolution. If US refuelling was removed, Saudi Arabia’s airstrike capacity would be severely reduced. This would reduce the direct civilian casualties (and US culpability in them) and could help shift the focus towards peace negotiations. Implementation of the War Powers Act would increase the accountability of the executive to Congress, something which could help reduce the risk of reckless US involvement in conflicts in the future.